Thanks to its extra-large feed tube that can accommodate whole or large pieces of veggies or fruits, you will save your time on pre-cutting. To get access to hundreds of recipes that can be prepared with the Magimix 5200XL model, just download a Magimix App to your smartphone or tablet. For cleaning the bowls, hand wash is preferable. 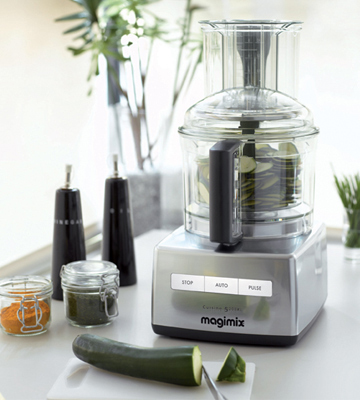 Multifunctional and efficient, this Magimix food processor boasts intuitive one-touch operation allowing you to accomplish a variety of tasks with ease. In the box, you'll find three bowls of assorted sizes and an impressive selection of accessories and attachments including a citrus press, a BlenderMix attachment for mixing liquids, and a whisk for beating eggs and cream. An ergonomic storage box is also included. 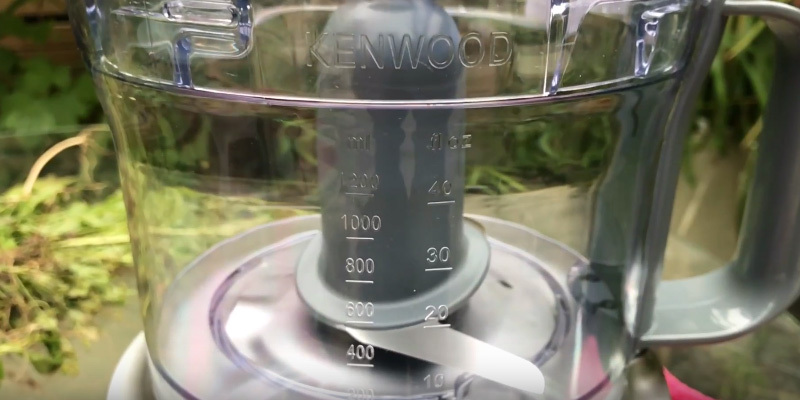 This Kenwood Multi-Pro food processor boasts as many as 8 speed settings and a pulse mode for precise control of the unit's operation and effective processing of both hard and soft vegetables, fruit, and other ingredients. The motor might emit smell at first. 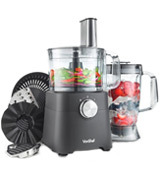 This multifunctional unit will help you quickly and effortlessly chop and slice veggies and fruits, make refreshing smoothies and hot soups (the blender is made of thermo-resistant glass), and knead dough. 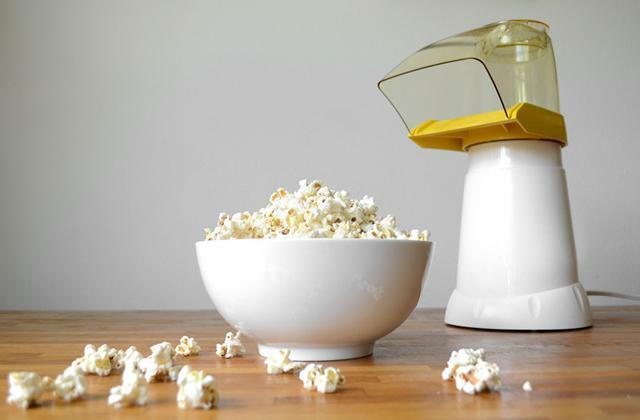 The appliance is easy to clean after use; all removable parts are dishwasher-safe. Equipped with a disk that can be used with one of the included interchangeable stainless steel inserts for coarse and fine grating and shredding your ingredients, the machine will make your meals preparation as easy as possible. It's a bit noisy during operation. The VonShef 13/294 food processor is an efficient kitchen appliance created to become your reliable kitchen helper in following both simple and original recipes. It boasts intuitive operation; ergonomic rubberized feet reduce vibration and noise level. After use, it is simple to disassemble for clean-up. The blades are manufactured under the PowerChop technology. Due to an optimal shape and cutting edge these blades ensure efficient procession of both solid and tender food. You will have to find a place to store the accessories. 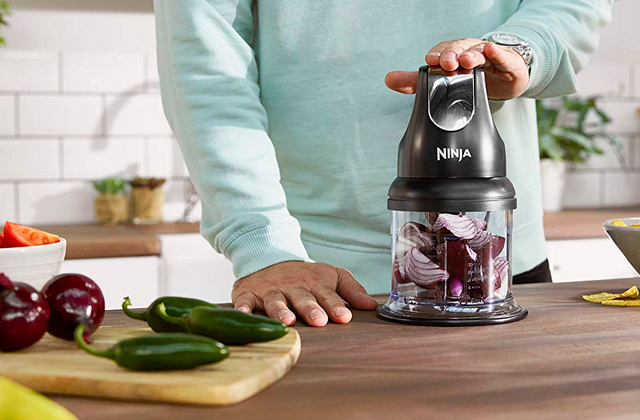 This high-performing food processor will allow you to chop, shred, and mix all the ingredients quickly and easily. It comes with lots of different attachments to help you process food in different ways. 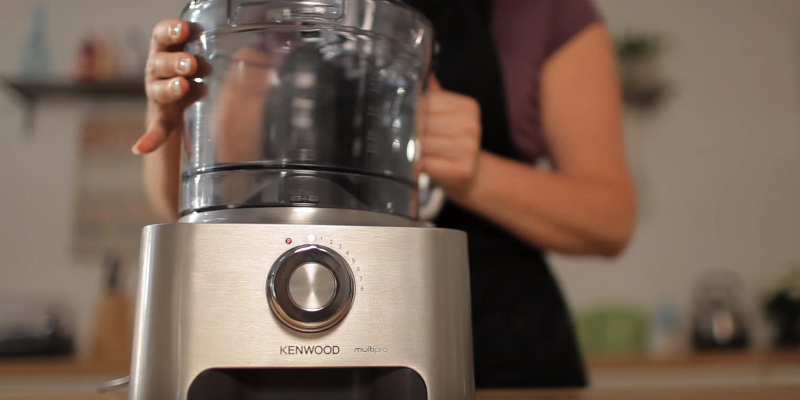 Compact and portable, this Kenwood food processor will perfectly fit even a small-sized kitchen. This efficient appliance is equipped with 2 working bowls and handles most kitchen tasks as easily as its more expensive competitors. A dough blade is not included. You can chop, slice, and grate various ingredients, make soups, sauces, cocktails, and other liquid recipes. 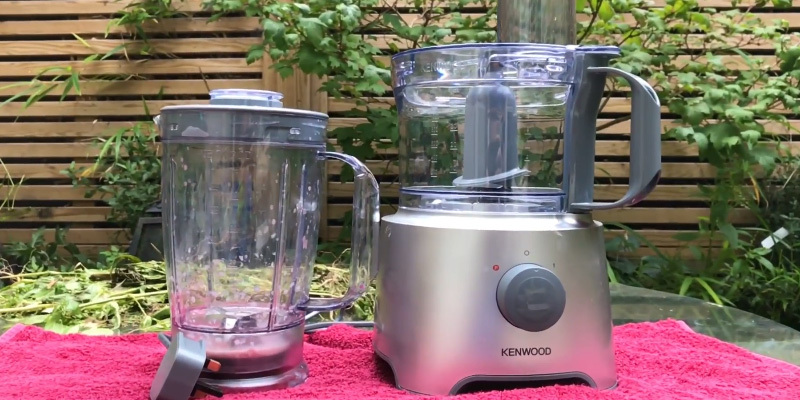 To give you control over food processing, this wonderful Kenwood model features two speeds and a pulse mode. If you are looking for an efficient, multifunctional food processor to save your time, money, and cooking space, consider this model. Thoughtfully designed and portable, it is able to replace as many as eight other appliances in your kitchen. 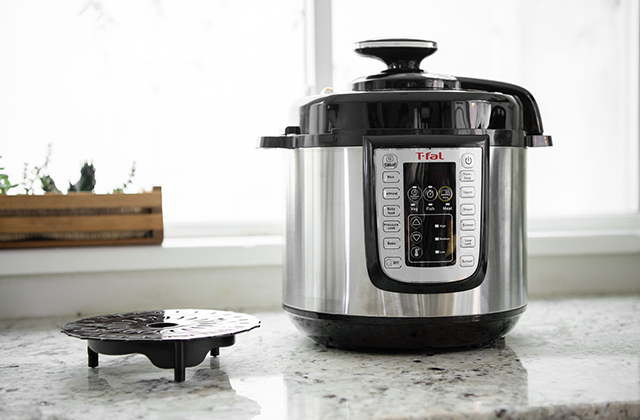 To help you handle your kitchen tasks with ease and comfort, the machine is equipped with an 1100-Watt motor, efficient and ultra-quiet in operation. The unit has three buttons on its front panel allowing you to use all the functions; the motor power adjusts automatically depending on the ingredients processed. 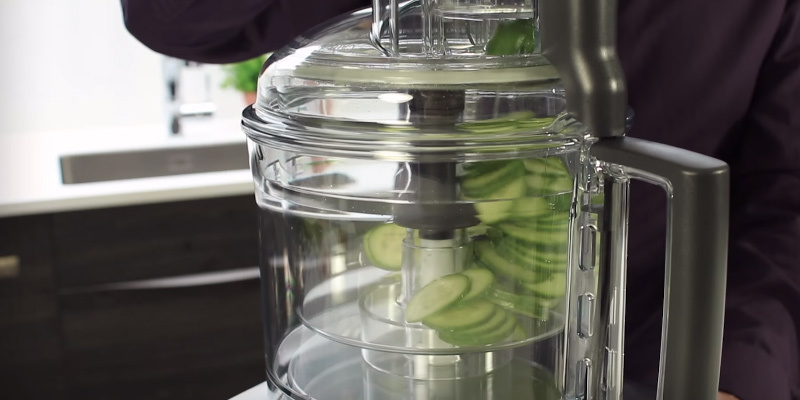 This functional food processor has an extra-wide feed tube allowing you to save lots of time on pre-cutting the produce: you will be able to process whole or large pieces of fruits and veggies. The appliance comes with three bowls of assorted sizes enabling you to perform as many kitchen tasks as possible. For example, the largest 3.6 L bowl is perfect for mincing, chopping, mixing, grating, slicing, and emulsifying foods as well as for kneading dough. The middle-sized 2.6 L bowl will come in handy for slicing and grating vegetables, fruit, and cheese. Finally, the smallest 1.2 L bowl is perfect for chopping onions and herbs and for making delicious salad dressings and mayonnaise. Now, let's look at the attachments and accessories included in the box. 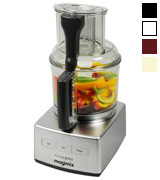 The Magimix 5200XL food processor comes with a triple pusher, perfect for slicing smaller items like carrots, spring onion, and celery. The main bowl can be used with a sharp stainless steel blade for mincing, chopping, blending, and emulsifying foods, a BlenderMix attachment to make creamy soups and smoothies, a whisk for beating eggs or creams, and a dough blade for effortless mixing and kneading dough. The midsized bowl can be used with two slicing discs (2mm and 4mm) and two grating discs (2mm and 4mm) for grating and slicing fruit, vegetables, and cheese. In the box, you will also find a citrus press with two cones for making freshly-squeezed lemons, limes, grapefruit, and other citrus juice. The provided mini bowl and mini blade allow you to process small quantities of food. In addition, the package includes a spatula for easy cleaning. To keep all accessories organized and within easy reach, an ergonomic storage box comes with the purchase. 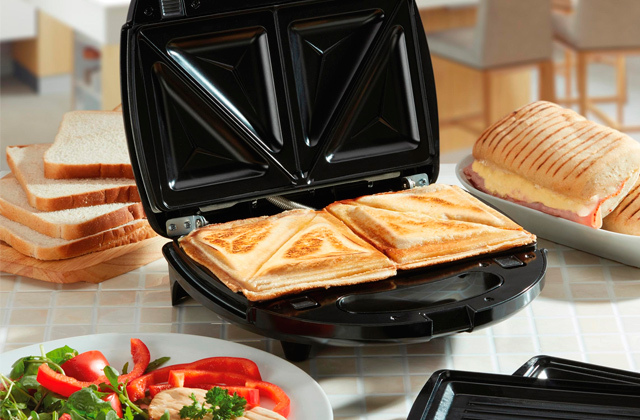 It has comfy slots for grating/slicing disks and a transparent lid to protect the attachments from dust. Additionally, you will get a recipe book with 100 culinary ideas and a free access to the Magimix App (available for your tablet or smartphone) with more delicious recipes you can follow using this wonderful appliance. 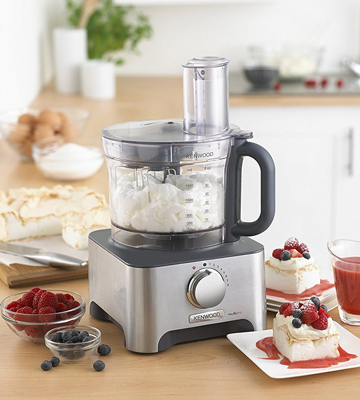 Designed to help you to prepare a family dinner, make nutritious smoothie or juice for breakfast, or knead dough and whip cream for delicious pastries to go with your tea, this Kenwood Multi-Pro food processor will handle most kitchen tasks with ease. The unit has a powerful 1000-Watt motor for efficient performance; it features eight speed settings and a pulse mode for the most precise control while processing various ingredients. This efficient model is equipped with a 3-litre main bowl, perfect for a variety of slicing, grating, and chopping tasks and a 0.5-litre mini bowl with its own blade for processing smaller quantities of food without the need to wash the larger bowl. 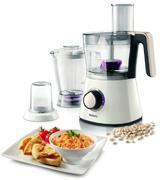 Moreover, you will get a 1.5-litre liquidizer for blending soups and sauces or making refreshing smoothies. 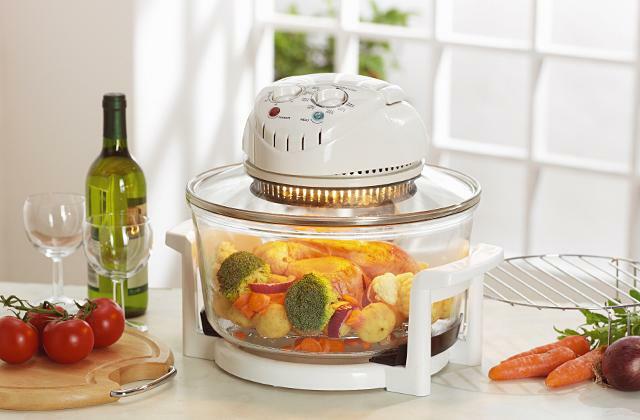 Made to last, the appliance has a die-cast all-metal housing, stainless steel knife blades, durable plastic bowls, and a thermo-resistant glass liquidiser. For convenient and safe use, the unit has non-slip feet, a safety interlock, and an ergonomic cord storage. All removable parts are dishwasher safe, plus a handy spatula is included in the box, so the unit is easy to clean after use. 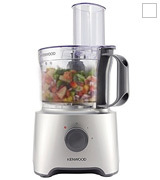 With this Kenwood food processor, you will get varied accessories for hassle-free food preparation. The main bowl can be used with a stainless steel knife blade for chopping vegetables and meat. You can go either with a 4-mm thin slice/fine grate disk, or a thick slice/coarse grate 4-mm disk for grating or slicing veggies or cheese; using these reversible disks is also a great way to save storage space. Do you like to make pastries and toothsome desserts? Use an included dough tool to knead dough and a dual metal whisk to beat eggs or whip cream. For chopping smaller items, use a 0.5-litre mini bowl with a mini blade. This model comes with a blender jar made of thermo-resistant glass so you can make appetizing hot soups and refreshing ice-cold smoothies. Both the food processor and blender were designed to be used on one base which also helps to save space in your kitchen. 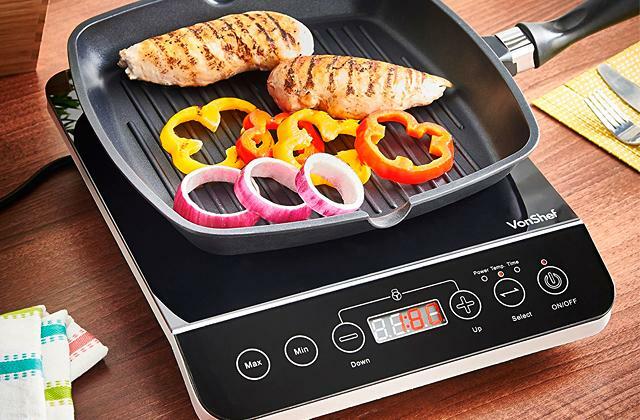 Summing up, this wonderful appliance thought-out to the tiniest detail can become your reliable kitchen aid that will make cooking easy and enjoyable. 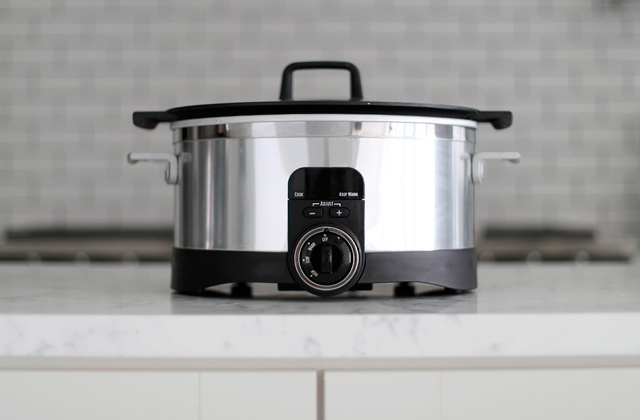 To cook delicious healthy meals out of the sliced, grated, and chopped ingredients, we recommend you to get one of these wonderful crock pots. 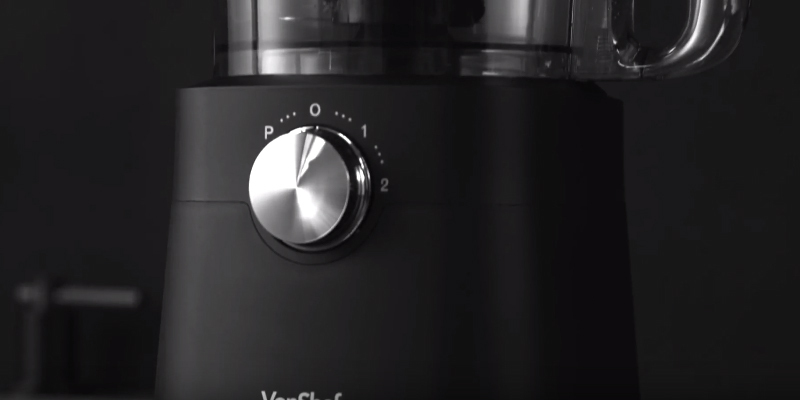 With the VonShef food processor, you will be able to spend less time chopping, slicing, and grating and dedicate more time to yourself and your family. The appliance has an efficient 750-Watt motor, 2 speed settings for better results depending on the ingredients, and a pulse mode allowing you to bring the bowl/blender contents to the desired consistency. To reduce vibration and noise level, the machine is equipped with reliable rubberized feet. The settings are easy to adjust thanks to an ergonomic knob on the unit's front panel. The appliance is equipped with a 2-litre bowl for processing the ingredients for your meals and a 1.8-litre blending jar to make creamy soups and healthy smoothies for your family in one go. Fruits, vegetables, and greens are easy to add to the bowl owing to an extra-wide chute. After you have all the foods processed, the unit is easy to disassemble; its removable parts are dishwasher safe, so you will save time tidying up your kitchen. Capable to replace several kitchen appliances, this model has a compact design; its bowl and blender are used on the same base. In addition, made in a black-and-silver colour scheme, this stylish food processor will add an elegant touch to your kitchen. Now, let's look at the attachments included in the box. Note that the blades and other metal parts are made of high-quality stainless steel to ensure excellent performance and durable use of the unit. So, the machine is equipped with a sharp chopper blade to chop, puree, or blend the bowl contents. Next, there is a holder to use with one of the three interchangeable inserts: a coarse grater, fine grater, and shredder blade. With these attachments, you will be able to grate or slice fruits, vegetables, and cheese. The box also includes an emulsifying disk for whipping cream, beating eggs, or making homemade mayonnaise. Besides, you will get a plastic dough blade for preparing delicious pastries. Moreover, the package includes a citrus juicer allowing you to make freshly-squizzed citrus juices in addition to wholesome smoothies you can prepare in the blending jar. 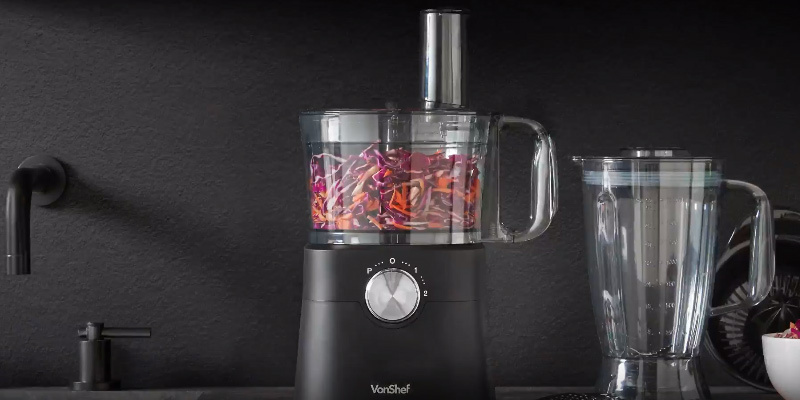 Summing up, with this wonderful VonShef food processor, you will be able to treat your family to delicious meals, followed by exquisite desserts and varied healthy drinks, without spending hours in your kitchen. If you are looking for an appliance for making nutritious vegetable, fruit, and leafy green juices, consider buying a masticating juicer. 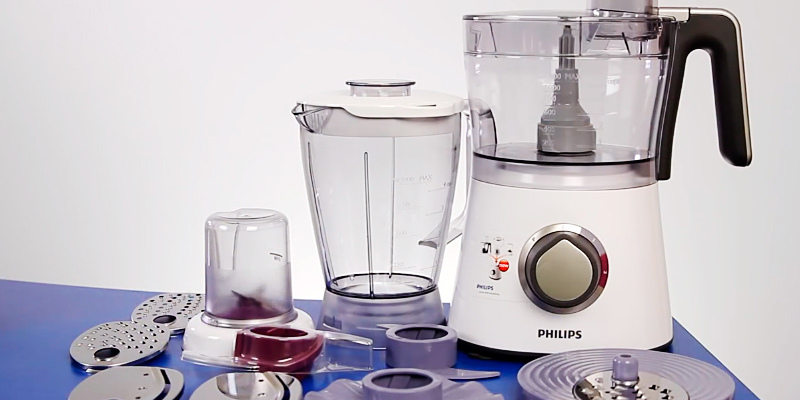 The Philips HR7761/01 is a high-performing and powerful food processor which allows you to knead a tough dough, grind, mince, and process food in a number of different ways, replacing mixers, blenders, and other kitchen appliances. The Philips HR7761/01 features 2-speed settings. It is preferable to use the lower speed for emulsifying or kneading while the higher speed is perfect for slicing, shredding, pureeing and mincing. In addition, the pulse option allows you to speed up the process of chopping if required. It comes with three processing bowls - a large 1500 ml bowl, a 1000 ml break-resistant jug, and a 250 ml grinding mill attachment. With this set, the food processing becomes a child's play as you needn't wash a bowl at every turn, you can just take another one. In addition, the food processor has compact dimensions and won't take much space in your kitchen. The housing and the bowls are made of impact-resistant plastic so you can be sure that Philips HR7761/01 will serve you for a long time. 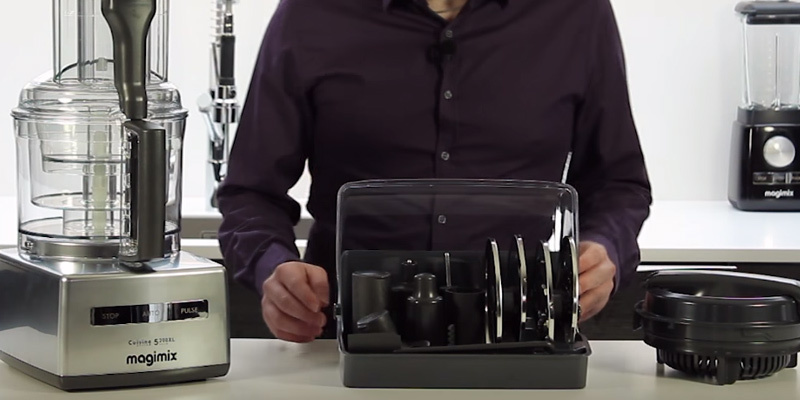 The Philips HR7761/01 comes with 7 attachments in the box. Here, you've got a kneading tool, an emulsifying disc and 5 stainless steel disc inserts for slicing, shredding and granulating. The manufacturer has designed the processor with colour-coded speed controls and accessories, therefore, you needn't look through the manual to assemble the unit. 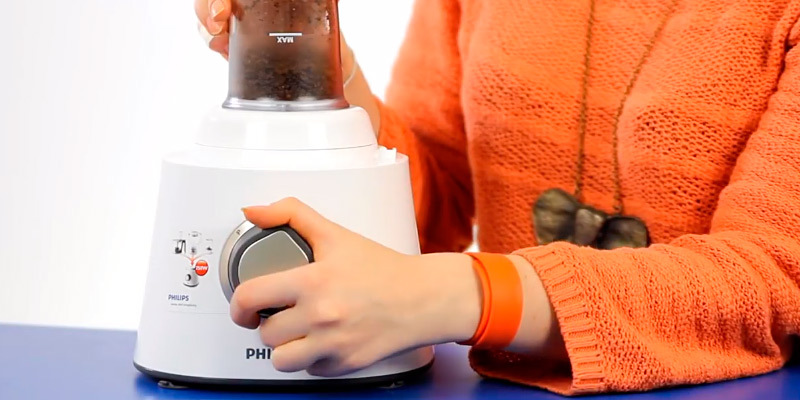 The Philips HR7761/01 has a safety lock and Eject button for comfortable and easy use. 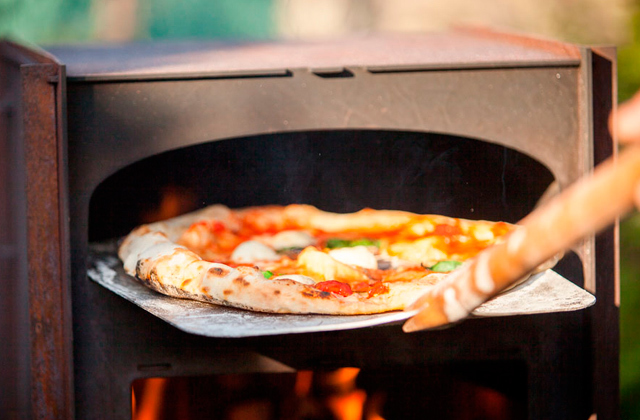 A sturdy base of the unit ensures stability even during kneading the stiffest dough. Moreover, all accessories and the bowl itself are dishwasher-safe. 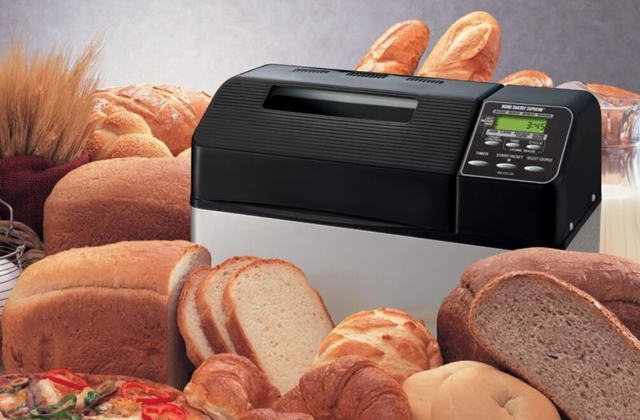 To prepare delicious homemade bread, consider buying a bread maker. It will keep soft and yummy in one of these wonderful bread boxes. To make your food preparation as easy and comfortable as possible, it is important to properly equip your kitchen, especially if it lacks space. 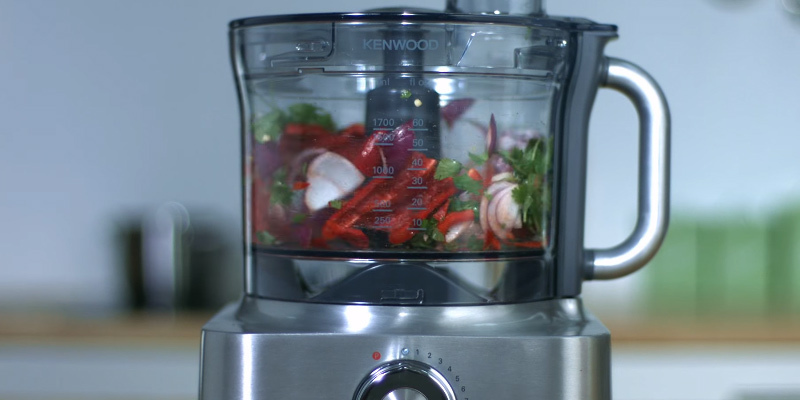 With this in mind, Kenwood has created this Multi-Pro compact food processor. 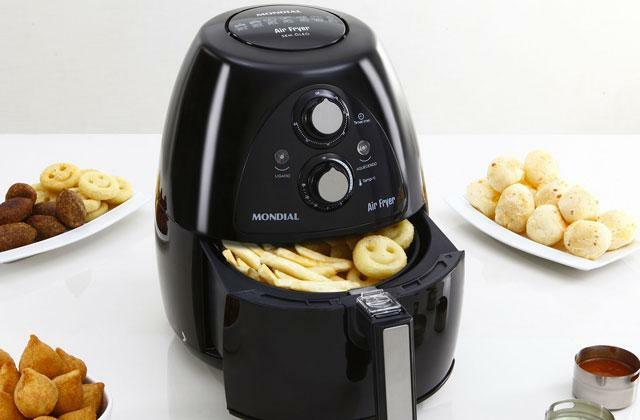 Like other models from this manufacturer, the appliance is made to last; its metal parts are made of high-quality stainless steel; its body and removable parts are made of durable plastic. To ensure optimal performance of the unit, it is equipped with an 800-Watt motor. Moreover, this compact machine features 2 speed settings and a pulse mode that will help you to get the desired food texture in a breeze. Equipped with a 2.1-litre bowl with a 1.2-litre working capacity and a 1.2-litre blender (both are used on the same base), the appliance is perfect for efficient chopping, pureeing, and blending of smaller quantities of food, which makes it a great choice for a small family or a couple. Elaborately designed, the food processor won't take much space on your countertop, nor will you need much space for storing parts and accessories. In addition to all its benefits, the unit has a sleek stylish design and is also available in white so you can choose the colour scheme to suit your kitchen interior best. 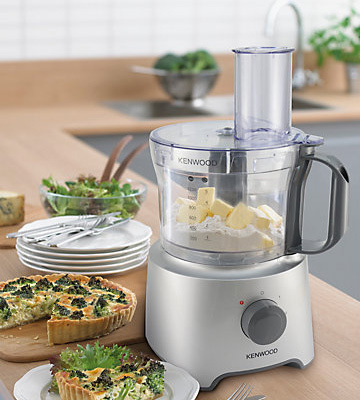 As compact as it is, this Kenwood food processor is equipped with a set of attachments for various kitchen tasks. As we have mentioned above, it has both a processing bowl and a blender. 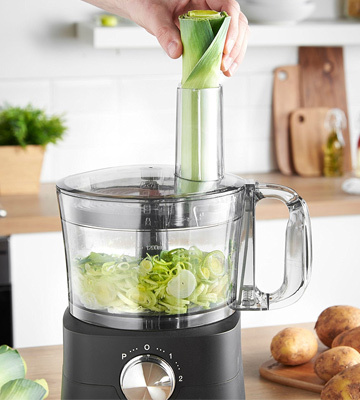 With this wonderful appliance, you will be able to chop and grate vegetables for fresh salads, make nutritious smoothies, process the produce before cooking your meals and blend creamy soups from the cooked ingredients. So, the package includes a stainless steel knife blade for chopping, blending, and pureeing foods. You will also get a reversible disc for coarse grating and thick slicing, which is quite enough if you do not use fine grate too often. Besides, using one attachment for both tasks is a plus because you will need less space for storing accessories. In the box, you will also find an emulsifying tool for beating eggs or whipping cream, allowing you to make desserts toppings and follow a variety of tasty recipes. When your delicious meals are ready, all parts are easy to clean in the dishwasher. 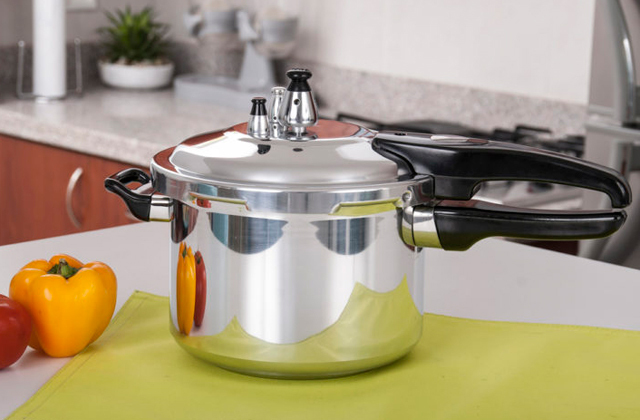 One more multifunctional appliance that will be appreciated in any kitchen is a pressure cooker, designed to make cooking delicious healthy meals a piece of cake. A food processor is a multi-functional device which is really irreplaceable among kitchen appliances. It can cut, chop, whisk, grate and even knead. These kitchen appliances have become really popular with housekeepers due to the wide variety of cooking options they provide and their relatively compact size. Equipped with a great number of attachments, a high-quality food processor will do the most difficult food preparing tasks for you, so you can save a lot of time. 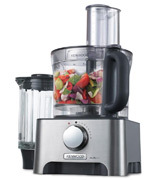 Equipped with a blender, food processors can be used for making smoothies and soups. You will be impressed by a variety of tasty meals and beverages you will be able to make. We have described five best models on the market in this food processor review so you can select the one that suits you best. 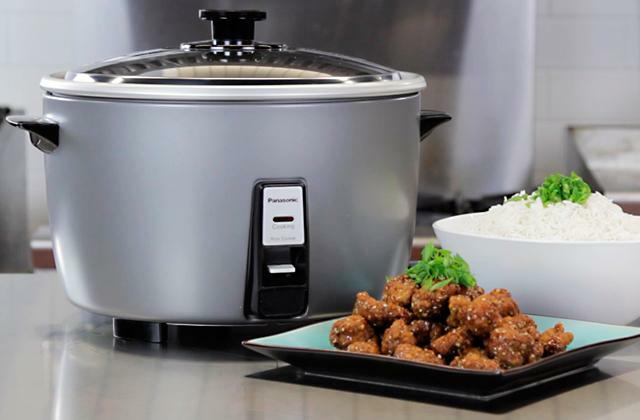 If you are looking for a handy appliance to cook wholesome and delicious meals, please look through our slow cookers and rice cookers reviews. The performance of food processors depends on their power and ease of speed control. The power varies from 80 to 1600 Watts. Thus, the power of 400-600 Watts is enough foк cutting vegetables. However, if you are likely to knead the dough, the power should not be less than 1000 Watts. Generally, food processors provide a number of speed that ranges for different operation modes (juicer, blender, kneading machine, etc.). Some models have fixed speed settings (4-15 modes). And others have smooth, manually controlled speed switch. The more speed modes your chosen model has, the more dishes you can prepare. Also, when choosing a food processor, you should pay attention to a pulse mode. It is a temporary acceleration which is switched on at the end of the work for better and faster preparation of food. Choose the design of the food processor carefully. It may vary depending on models and price, but all of them have common components - the bowl and the blades (discs). Normally, the bowl is made of transparent plastic, but sometimes it's made of glass or metal. Customers generally prefer to use plastic bowls since they don't break and it's easy to track the whole process. Depending on the size of the bowl, the portions will vary. If you're going to cook for a big family, calculate a portion for each. Bowls that can hold up to 1200- 1500 ml should be enough for a family of 4-5 people. Some models have two bowls of different sizes. The process becomes much easier since you can chop everything into a small bowl, move the ingredients into a big one and continue the process. 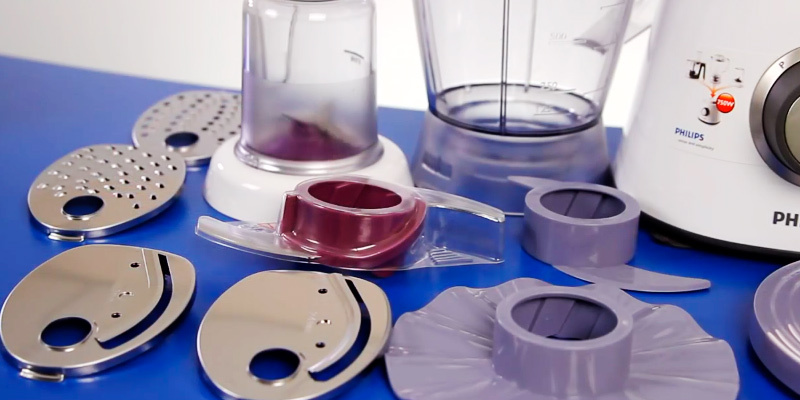 The number and type of blades (or discs) determine the capabilities of a food processor. Apart from basic blades for chopping the ingredients (different blades and graters), you might have an extra set of attachments that will turn a food processor into a juicer, kneading machine, ice crusher or blender. Most kitchen food processors are quite large but they make up for it by offering a variety of features and levels of performance. However, despite their dimensions, kitchen food processors are compact and perfectly fit most mid-sized kitchens. The casing can be either metal or plastic. The metal casing is considered to be more reliable and long-lasting, however, plastic is also rather impact-resistant. Usability is the main option when choosing the right processor. The major benefit of using food processors is a number of different features which make the process of cooking easier and quicker. The best food processors usually have such add-ons as a safety lock, a blade locking system, non-slip feet and a cord storage area. 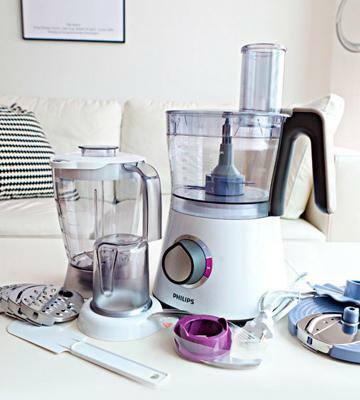 If you are looking for an easy-to-clean food processor, please make sure its removable parts are dishwasher-safe. It is hard to believe that a food processor was invented just half a century ago for it has become an essential piece of kitchen equipment nowadays. However, it is true - the appliance was introduced by Pierre Verdon in 1971. Unlike a blender, it was able to process foods without adding liquid. The machine was aimed to cut food preparation time in a professional kitchen. Luckily, after some time and with some adjustments made to adapt it for home use, a food processor became one of the most popular kitchen appliances. Today, you can select units that easily handle most cooking tasks from chopping, slicing, and grating to making wholesome beverages and delicious desserts to pamper your nearest and dearest. We would like to list some uses of the appliance and tips and tricks to ensure excellent results each time. 1. You can make bread crumbs for making crunchy fried foods and for many other recipes. 2. Grind nuts and granulated sugar for dusting cakes, cupcakes, and other desserts. 3. Experiment making wholesome and nutritious nut butter from various nuts. 4. Prepare delicious dairy butter out of heavy whipping cream. 5. Make mouth-watering frozen fruit sorbet, a healthy homemade alternative to ice-cream. 6. Prepare healthy homemade ice-cream. 7. Use your food processor for tearless onion chopping (pulse mode is recommended if you don't want it chopped too fine). 1. Make sure that the bowl is on the base and the blade is properly affixed before you add the ingredients. 2. When processing hard foods like nuts, cheese, or garlic, for even chopping it is recommended to drop them through the feed chute when the appliance is on. 3. Use a pulse button to have the chopping or blending immediately stopped just when you need; this setting will give you more control over food processing. 4. To prevent leakage, do not overload the food processor bowl and liquidiser. For the best chopping and blending results, please keep in mind the bowl and blender working capacity and carefully follow the manufacturer's instructions. Most units have an ergonomic max level line to indicate how much liquid you can add. 5. Making a dough, add dry ingredients first and use a pulse button to mix them. Then, slowly pour chilled liquid ingredients into the feed tube while the unit is operating. Try not to over knead the dough, it usually takes just a half a minute to get a perfect consistency. 6. For the best chopping and shredding results, foods like meat, poultry, cheese, and dried fruit are recommended to put in a freezer for a quarter to half an hour before processing. 7. To save even more time on food preparation and the appliance cleaning, you can chop, shred, and mince foods in advance, vacuum seal them and keep in your fridge or freezer. 8. After cleaning the food processor, it is important to have all the parts properly dried before you reassemble the unit. This will help to prevent odours and bacteria growth. 1. Food processor, Wikipedia. August 4, 2016. 2. Jessica Harlan Before You Buy a Food Processor, About. August 23, 2016. 3. Cheryl Slocum Here's the right way to use your food processor, Mashed. 4. Brent Furdyk 13 Magical Ways to Use a Food Processor, Foodnetwork.ca. September 26, 2016. 5. Food processor, Encyclopaedia Britannica. 6. Rochelle Bilow It Is Very Possible You Are Making These 6 Food Processor Common Mistakes Bon Appétit. May 11, 2016.